السلطات من أكثر الأصناف تنوعاً وسهولةً؛ فبإمكانك ابتكار ما تريد واختيار الخضار أو حتّى الفواكه التي تريدها لخلق الطبق الذي تريده. في سلطة اليوم استخدمت البرغل كمكوّن أساسي، ولمن لا يعرف البرغل فهو عبارة عن حنطة، قمح، مجروشة تستخدم في مطابخ عالمية كثيرة أهمها الشرق أوسطي، الآشوري، الأرمني، التركي، اللبناني والمطبخ المتوسطي. ويستخدم البرغل بشكل خاص كشوربة، أو كبديل عن الأرز، في السلطات،المخبوزات، أو في حشوات خضار أو لحم مختلفة. وتختلف تسمية البرغل من دولة لأخرى؛ ففي السعودية على سبيل المثال يسمى جريش ومنه أيضاً يحضر الطبق السعودي التقليدي الجريش. في بلاد الشام استُخدم البرغل قديماً كبديل عن الأرز بشكل كبير وحينما بدأت صناعة الأرز كانت العائلات الغنيّة هي أول من بدأ باستخدامه في حين كانت العائلات المتوسطة الحال تعتبر أن استخدام الأرز كجزء من الأكل رفاهية كبيرة وقد تشتريه للمناسبات الكبيرة والمهمة. ومن هنا جاء المثل الشعبي: “العز للرز والبرغل شنق حاله”. أحب البرغل كثيراً ولا أتناهى عن إدخاله في الكثير من المأكولات كالسلطة على سبيل المثال. في هذه الوصفة حضّرت سلطة البرغل كطبق جانبي إلى جانب ريش لحم الخروف وبيوريه البازيلاء. بإمكانكم إيجاد وصفة ريش لحم الخروف أو بيوريه البازيلاء هنا. 3- نضيف البرغل ونخلطه جيداً مع بقية المقادير ثم نضيف البقدونس، السبانخ، الخيار والقليل من الجوز، نقلب جيداً ثم نضيف زيت الزيتون. 4- تذوَّق السلطة لتعرف إن كانت بحاجة للمزيد من الملح، زيت الزيتون أو دبس الرمان. Salads are always exhilarating in summer! You can choose any fruits or vegetables you want to create a different tasty salad every time. In this salad I chose Burghul as a main component, for those who have no clue what Burghul could be, it’s actually wheat which has been cleaned, parboiled, dried, grounded into particles and sifted into distinct sizes. Burghul is most commonly used in Middle Eastern, Assyrian, Armenian, Turkish, Lebanese and Mediterranean kitchens. And it’s mainly used in salads, or as a substitute to rice, in soups, bakery goods, and to stuff vegetables or meat. Burghul have different names in the Middle East; In Saud Arabia for example it’s called Jarrish as it’s used to prepare the Saudi Arabian traditional dish Jarrish. In the Levant region Burghul was previously used instead or rice and when the industry of the rice started rich people were the first to buy it and cook it. I like Burghul and I usually use it for salads. 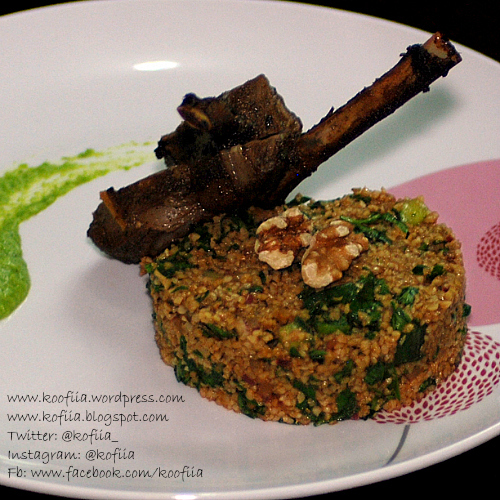 In this recipe I prepared Burghul salad with minted lamb cutlets and pea puree which I already posted their recipes here. 1- 1 cup of Burghul. 2- 1 medium onion, finely chopped. 3- 1 cup of parsley, chopped. 4- 1/2 cup of baby spinach, chopped. 6- 1/4 cup of walnuts halves. 7- One to two Tbsp of Pomegranate molasses. 10- 1 Tbsp of paprika. 1- Soak the burghul in water for 20 to 30 minutes till it doubles in size and becomes soft. 2- Add all of the spices: salt, black pepper, paprika and Pomegranate molasses to the onions and rub, using hands, very well. 3- Add the Burghul, combine and rub very well. Add the parsley, spinach, cucumber and walnuts and mix. Finally, add some olive oil. 4- Taste the salad to make sure it’s balanced and doesn’t need more salt, Pomegranate molasses or olive oil. تعد الفريكة من حبوب القمح الأخضر الطري التي تُحصد قبل أن تجف. تُعرض للهواء الطلق ثُم للحرارة دون حرقها مما يُعطيها طعماً مدخناً. تُجرش ثم تُباع في الأسواق للاستخدام. تحتوي الفريكة على عناصر عذائية وفيتامينات أكثر من القمح أو الأرز لإنها حُصدت باكراً. كما أنها تساهم في تنظيم امتصاص السكر في الأمعاء مما يجعلها غذاءً مناسباً لمرضى السكري. منذ القديم دأب المطبخ العربي \ الشرق أوسطي على استخدام الفريكة في مأكولاته، فهي مشهورة جداً في كل من سوريا ولبنان والأردن وفلسطين بشكل خاص؛ فنظراً لطعمها المُدخَّن تعتبر طبقاً ممتازاً كسلطة أو شوربة أو حتّى بديلاً عن الأرز. وكانت والدتي ترفق المسخن دائماً بشوربة الفريكة، لدرجة أن طبق المسخن بالنسبة لي صار لا يُحضر إلا برفقة شوربة الفريكة. على الرغم من هذا لم أجرب الفريكة كطبق بديل عن الأرز إلا في الإمارات في إحدى العزائم. 10- كوب إلى كوبين من مرق الدجاج أو اللحم أو الخضار, لمعرفة صنع المرقة اقرأ هذا الموضوع. بالإمكان الاستعاضة عن المرقة بالماء في حال لم تتوفر. 1- تغسل الفريكة جيداً من الأتربة والأوساخ والأفضل أن تُنقبيها قبل ليلة حتّى تتأكد من عدم وجود الحصى فيها. 2- تنقع الفريكة في ماء ساخن لربع ساعة. 3- تقلب البصلة بالسمنة على النار حتى تبدأ بالذبلان. 4- تضاف اللحمة مع البهارات إلى البصلة والسمنة وتقلب جيداً حتى النضج. لا تكثروا من البهارات حتى لا تفقد الفريكة طعمها. 5- تضاف الفريكة وتقلب جيداً مع السمنة. يجب أن تغلف السمنة جميع حبّات الفريكة. 6- تُضاف المرقة إلى الفريكة. حاجة الفريكة للماء يعتمد على نوعها و لونها، فبالإمكان الاكتفاء بداية بكوب واحد ومن ثم تقوم بزيادة كمية المرق حسب الحاجة. 7- بعد أن تتشرب الفريكة كل المرق تُخفض درجة الحرارة لحين الاستواء. بالإمكان تقديمها مع دجاج أو خضار مشوية. في الصورة أعلاه قدمتها مع الدجاج المشوي والبطاطا الوردية. Freekeh “pronounced Freekah”, is processed wheat which was harvested while the grains are still soft and green. They expose them to the sun to drain then set them on fire without burning the seeds but only to give them this hint of smokiness flavor. They finally thresh them and sell them. Freekeh contains vitamins and minerals more that the mature wheat. Moreover, it regulates the sugar absorption in the intestine which makes it a healthy choice for diabetics. 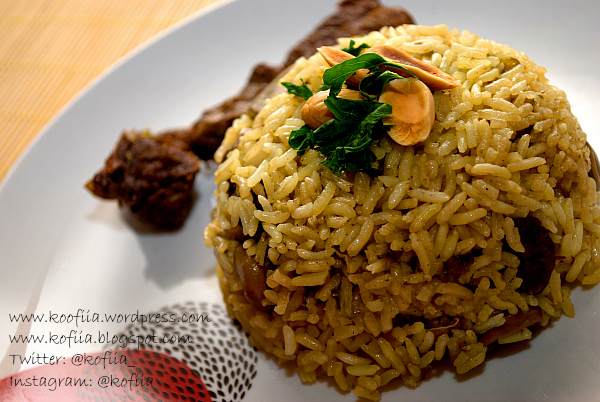 Freekeh is very popular in Middle Eastern dishes particularly in Syria, Lebanon, Jordan and Palestine. The smokiness flavor makes it a good choice for salads, soups and a substitute of rice. My mum used to prepare Freekeh soup whenever she makes Musakhan “a traditional Palestinian main dish” to the extent I thought Freekeh soup has to be made every time I prepare Musakhan for my future family. However, I have never tried Freekeh as a substitute or rice (Freekeh pilaf) till I visited Dubai and tried in one of the family gatherings. You can easily find Freekeh worldwide in the health or whole grains sections of every supermarket, jusr search very well. I even found it in small towns of Australia. If you couldn’t find it where you live just visit any Middle Eastern grocery and you will definitely find it. 1- 1 cup of whole freekeh, not cracked. 2- 2 Tbsp of Ghee. You can use butter or canola oil instead. 3- Medium onion; finely chopped. 4- 100 grams of minced meat. 5- 1/4 tsp of cardamom. 6- 1/4 tsp of black pepper. 7- 1/4 of all spice. 9- A pinch of cinnamon. 10- One to two cups of chicken stock. You can use water instead. 1- Make sure the type of Freekeh you buy has no grits. Wash them very well. 2- Soak the Freekeh in hot water to 15 minutes. 3- Heat ghee in a medium saucepan. Sauté the finely chopped onions. 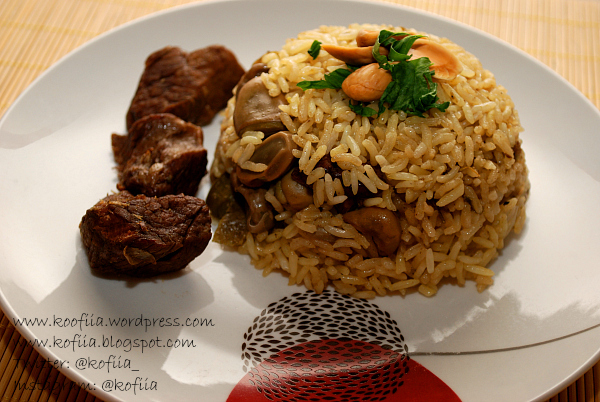 4- Add the minced meat with all the spices and stir till the meat is almost cooked. Don’t add a lot of spices as the Freekeh will lose its taste. 5- Add the Freekeh and stir very well. 6- Add the boiled water or stock to the Freekeh. Start with one cup and gradually add more if needed, one cup might be enough but it all depends to the type of Freekeh you have; different types of Freekeh absorb different amounts of water. 7- When the Freekeh absorbs all the water reduce the heat for 20 minutes or till cooked, some Freekeh types need one hour to two to be cooked. Read the instructions on how much time the Freekeh you buy needs to be cooked. 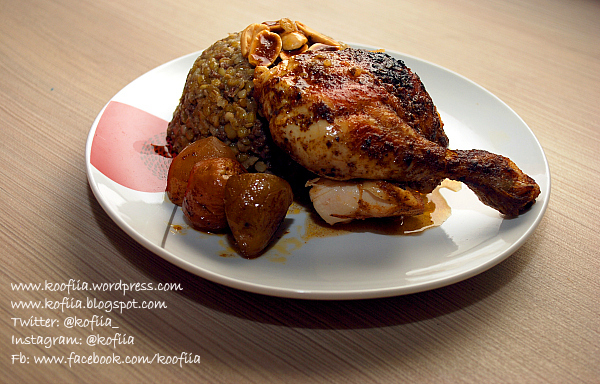 I served it with roasted chicken, roasted désirée potatoes and fried almond. لا تقدم عادة ريش اللحم أكانت مشوية أو مقلية كوجبة رئيسية في المنطقة العربية على عكسها في الغربية حيث يشتهر الغرب بتبهيرات مختلفة لريش لحم الضأن والتي تضفي عليها مذاقاً لذيذاً. طريقة تنظيف رف الريش وقصها تتوافر على اليوتيوب لكن من الأفضل أن تطلب من اللحام تنظيفها وقصها إلى ريش منفردة أو عدَّة ريش متلاصقة بناء على رغبتك. 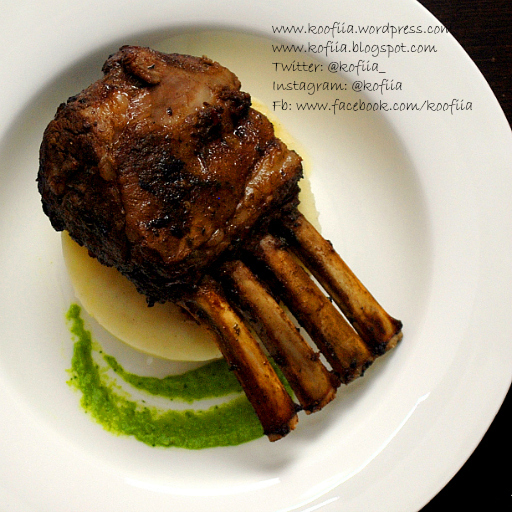 Racks of Lamb are not really popular in the Levant region; however, it’s much desired in the west. Moreover, plenty of recipes are available over the web or cook books. It’s not preferred to french the rack of lamb at home. I don’t prefer it myself, it’s better to get them frenched directly from the butcher as you can also request to cut them into single chops. 1- Half bunch of mint, finely chopped. 2- 3 crushed garlic cloves. 3- Juice of half a lemon. 4- 1 Tbsp of mixed spices. 5- Salt and pepper to taste. 1- 250 grams of frozen peas. 2- 1 Tbsp of melted butter. 3- 1 Tbsp of milk. 4- Salt and pepper to taste. 1- Wipe the meat off before adding the marinade. Mix all the ingredients together and marinate the rack of lamb for at least three hours. 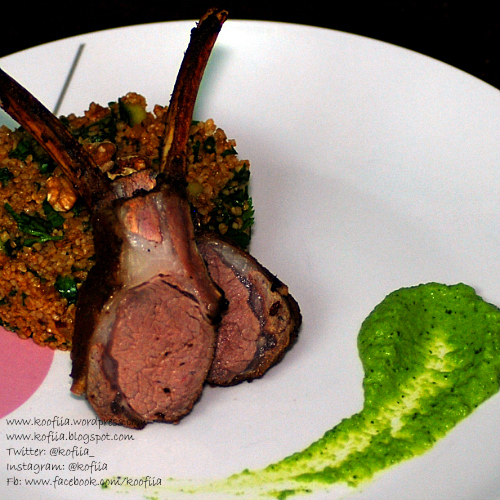 2- Take the rack of lamb out of the fridge an hour before so it can reach the room temperature. 3- Add some olive oil to a pan that it’s safe for the oven and sear the rack of lamb by giving it some golden color from all sides. 4- Preheat the oven to 200 C. place the pan for 10 minutes before reducing the temperature to 180 C for another 10 to 20 minutes depending on the degree of doneness you prefer your meat with. 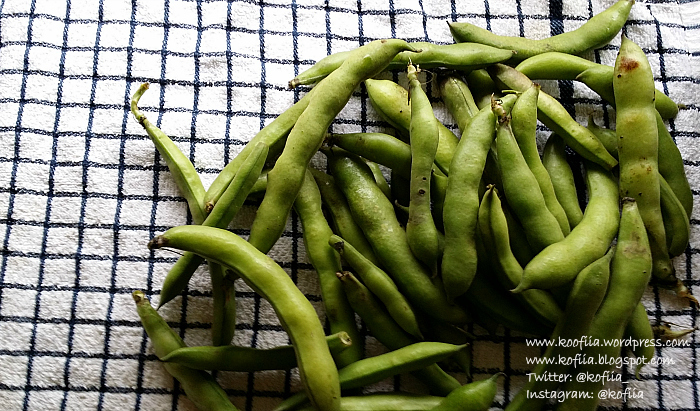 1- Cook the peas in boiling water for 3 minutes or until tender. Drain and add to the food processor. 2- Add the butter, milk, salt and pepper and mix. You can add some of the remained boiled water or more milk till you reach the desired smoothness. I served it with mashed potato.